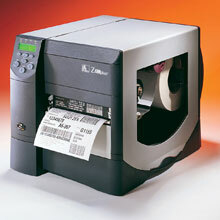 Zebra Z6M Plus - Thermal transfer, 203 dpi, 10 ips, 6.6" print width, ZebraNet PrintServer II & serial interfaces, 8MB RAM & 2MB flash. Includes ZebraLink & US power cord. Order cables separately. See accessories. The new Z6M Plus is up to five times faster than the original Z6M printer when processing complex, variable-information labels. Faster processing results in faster first label out and less time between labels. With intuitive controls, optional internal Ethernet connectivity, and print speeds up to 10"/254 mm per second, the new Z6M Plus metal printers from Zebra provide exceptional performance and value. Rewind (PCB Maintenance Kit) for the Z6MPlus. This is a Zebra printer repair part. The Zebra Z6M00-2001-0020 is also known as ZEB-Z6M0020010020	or Z6M0020010020	.